Mother of IDF soldier Hadar Goldin reaches out to Gazans after Israel says it will restore electricity supply to the enclave. 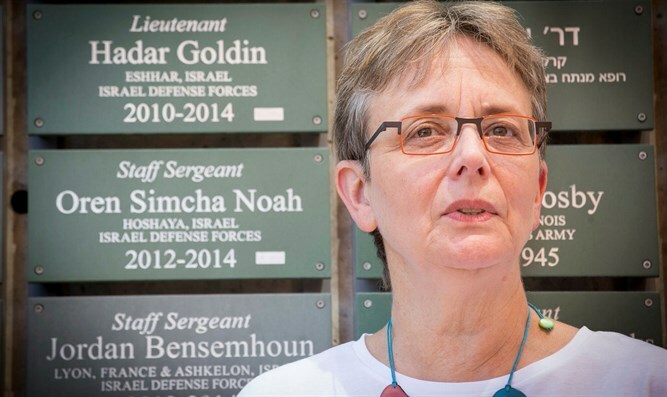 Dr. Leah Goldin, mother of IDF soldier Hadar Goldin whose body has been held by Hamas terrorists since the 2014 Operation Protective Edge, on Sunday reached out to the residents of Gaza through the Arabic-language Facebook page of the Coordinator of Government Activities in the Territories, Maj. Gen. Yoav Mordechai. Her plea came after Israel announced it would restore the full 50 megawatt supply of electricity to Gaza, despite ongoing rocket fire emanating from the Hamas-ruled region. "Residents of Gaza, mothers, fathers and children, the kidnapping of bodies is unacceptable and inhumane. Every mother wants to visit her son's grave and the failure to return Hadar Goldin for burial is considered a crime in Islam," wrote Leah Goldin. Earlier on Sunday, Energy Minister Yuval Steinitz (Likud) ordered the Israel Electric Corporation to restore Israel’s supply of electricity to Gaza to its pre-June 2017 level, following a request by the Palestinian Authority. Last week, the Palestinian Authority announced that it had agreed to renew payments to Israel for the delivery of electricity to Hamas-ruled Gaza, following the signing of a comprehensive reconciliation agreement between Fatah and Hamas in October. A long-running financial dispute between the two longtime rivals led the PA to deny payment for electricity delivered to Gaza. The move led to a 50 megawatt reduction in the supply provided by Israel to Gaza. This forced Hamas officials to cut the time public electricity, not including power from privately owned generators, is offered to Gaza residents by 50% - from eight hours a day to four. Israel’s decision to restore the electricity came despite the fact that in late October and again in December, Israeli forces discovered terror tunnels extending from the Gaza Strip into Israeli territory. Gaza-based terrorists have also fired dozens of rockets and mortars at southern Israel in recent weeks, including three last Wednesday alone.